All you need to know about the 'g' version of Genie Scout for Football Manager 2019. 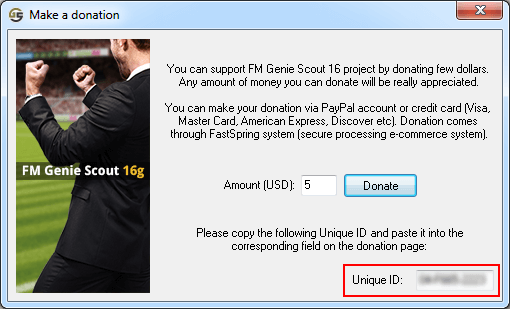 People who support the development of Genie Scout with donations every year, are entitled to receive the special "g" edition which is ad-free and has a few extra features. I have just donated, what happens now? After the donation you will receive an e-mail with the link to download Genie Scout 19g and a key.g19 file (the key file might arrive in a separate email). That email will also say that you should receive your key within the hour, but there's a chance it can take up to 24 hours. First beta 1 build 901 was made available on 19 October 2018. Current build 920 was released on 20 March 2019. Current build 920 is compatible with FM 19.3.4 (current), 19.3.3, 19.3.2, 19.3.1, 19.3.0, 19.2.3, 19.2.2, 19.2.1, 19.2.0, 19.1.5, 19.1.4, 19.1.2, 19.1.1, 19.1.0, 19.0.3, 19.0.2 and 19.0.1. It should work on Windows XP, Vista, 7, 8 and 10. It's not compatible with Mac or Linux at all. Make sure to have FM19 open and a game loaded there. Make sure to have your game saved before trying to load it in GS19g. Close FM and re-open it, then try load game again. Eugene will always aim to fix more issues with new builds. The 'g' edition has no advertisements and 7 extra features. GS Stats - Provides you with in-depth player development knowledge based on the history of thousands of games. GS STATS: The most significant Genie Scout feature ever. In-Game Scout - Click the (i) icon next to player's name within FM normally shows up a pop-up box with his attributes and some quick details. With IGS enabled, this pop-up box is enhanced with many added insights, including potential skills and rating. You no longer need to switch to the GS window to check on hidden attributes or potential ability. Roles & Duties - Ratings on 99 Roles & Duties available with ability to search. You're able to find a player perfectly fitting to your tactics. Support for graphics - If you have custom facepacks and/or kitpacks added to your FM, it should show on player and team profiles on GS. Top Players Lists - Automatically generated lists for best players, most promising and top bargains in the world, by position. Where to find my Genie Scout Unique ID? As the public edition of GS19 won't be made available til late November, you can find your Unique ID in older versions; more specifically GS18, GS17, GS16, GS15, GS14, GS13, GS12 or GS11. Once you open GS, click the big circular icon to the top left corner that should open the main menu. Go to 'Help' and then find & click 'Donate' to the right column that slides next to it. A popup window will come up, you need to copy the Unique ID. I donated but I haven't received my 'g' edition yet! Why??? The process is almost fully automated. There is a chance of delay for the delivery of your download link and key file, but shouldn't take more than 24 hours. Please remember Eugene is handling the delivery of keys for the "g" edition on his own. He is a married man with 2 little kids and a regular job, so please keep that in mind if you panic or feel frustrated for a possible delay. What to do with the key.g19 file I received in the email? In order to make GS work properly, you have to place this file into FM Genie Scout 19g directory (by default 'C:\FM Genie Scout 19g'). The key-file is linked to your PC configuration via Unique ID you provided to Eugene when donating. If your Unique ID changes (due to PC configuration change, or re-installing of OS), all data in the "g" edition of your FM Genie Scout will be distorted. In that case you need to send Eugene your new Unique ID, and he'll provide you with a new key-file. At any case, do not try to open this file. All you need to do is place it in the correct folder. Can I use the key file to another computer? No, Unique ID is actually unique per computer. So you'd have to ask Eugene to provide you with more keys, given that you send him all your Unique IDs. You don't need to donate again for that. I donated for GS18g. Do I have to donate for GS19g again? Yes. Donations go directly to Eugene (GS author) and he needs your support every year to keep producing Genie Scout. If you don't want to donate, you can wait for the public version. Do not use this topic to report bugs! What if we already donated for fmscout19g ? Do we have to donate again ? You are reading "Genie Scout 19g FAQ".